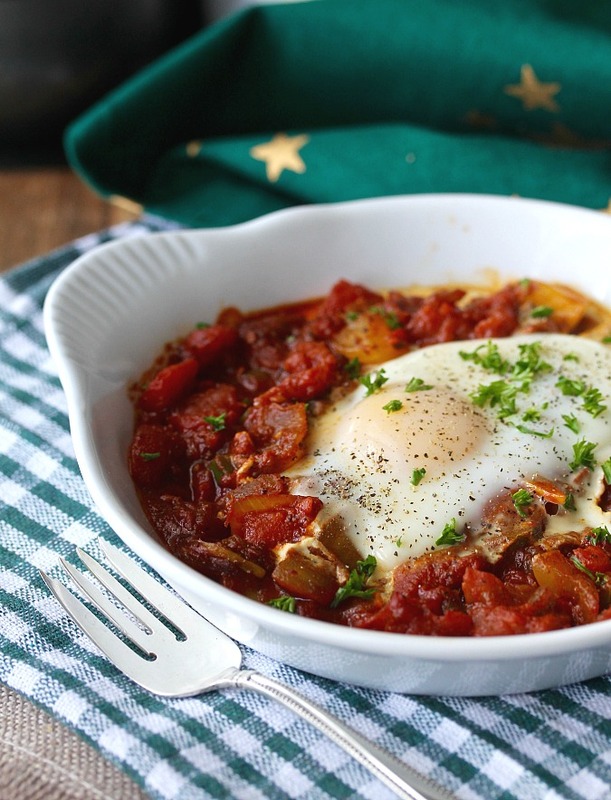 Shakshuka is a flavorful dish of eggs poached in a spicy tomato sauce. It's origins are North African and it is now a very popular breakfast in Israel. This post is sponsored in conjunction with BrunchWeek. I received product samples from sponsor companies to aid in the creation of the BrunchWeek recipes. All opinions are my own. 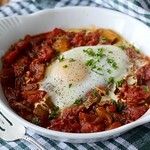 The spicy tomato sauce in the shakshuka (don't you love the name?) is flavored with a wonderful combination of spices. The ingredient list is long, but all of the elements in this recipe come together to make a "jump-up-and-down, I can't believe how good this is" dish. After falling in love with the flavors of this sauce, I made it again, and instead of poaching eggs in it, I used it to poach halibut for dinner. Delicious. In fact, it was so tasty, that I made it a third time with cod for Easter dinner. You can poach the eggs together on the stove top in a large skillet, or you can transfer the prepared sauce to individual dishes and poach the eggs in the oven. This is really convenient when making breakfast or brunch for a crowd. Just place your small baking dishes on a baking sheet, and place them in the oven until the eggs have set. You can make the sauce in advance, heat it up when you are ready to serve brunch, divide it among your ramekins, add the eggs, and bake! Would you like to win an Instant Pot? Dixie Crystals Sugar is giving one away for BrunchWeek. You can enter to win by visiting this post and scrolling down to find the entry form. I want one of my readers to win! P.S. There are lots of other prizes you can win from each of our seven sponsors. After the recipe, be sure to check out the rest of the BrunchWeek recipes and enter the drawing. We've got you covered for Mother's Day. And visit this post to see the Instant Pot or other cool prizes. This recipe describes the oven method for poaching the eggs. To make the eggs on the stovetop, turn off the heat and crack the eggs and drop them into the sauce. Turn the heat back on to a low simmer, and cook for about 10 minutes, while basting the eggs with the sauce. Then cover and cook for an additional 3 minutes. 1 cup (20 grams) loosely packed greens, coarsely chopped. I used Cal-Organics Spinach. Optional garnishes from one of our sponsors: Cento marinated artichoke hearts, chopped, capers, and/or Kalamata olives, chopped. In a 12 inch skillet, heat the olive oil over medium heat. Cook the onion and garlic for 5 minutes. Add the jalapeño, salt, and pepper, and the paprika, caraway, cumin, and turmeric. Cook the mixture, stirring, for one minute. Add the tomatoes, tomato paste, honey, and vinegar. Lower the heat to to medium low, and cook for about 15 minutes. Add the spinach or other chopped greens. Preheat the oven to 375 degrees F. Divide the sauce among 6 ramekins or small baking dishes and place the dishes on a baking sheet. Divide the feta among the baking dishes and press the pieces into the tomato sauce. Make and indentation with a spoon into each baking dish, and add an egg to each. Sprinkle each with the optional olives, chopped artichoke hearts, and/or capers. Bake until the eggs are cooked with the whites set, and the yolks are still runny, about 10 to 15 minutes. You can baste the eggs with the sauce if you like. Serve with crusty baguettes to sop up the sauce. a Rafflecopter giveaway Disclaimer: Thank you to #BrunchWeek Sponsors: Dixie Crystals, Cabot Cheese, LorAnn Oils and Flavors, Cento Fine Foods, Michigan Asparagus, Cal-Organic and Eggland’s Best for providing the prizes free of charge. These companies also provided the bloggers with samples and product to use for #BrunchWeek recipes. All opinions are my own. The #BrunchWeek giveaway is open to U.S. residents, age 18 & up. All entries for the winner will be checked and verified. By entering you give the right to use your name and likeness. The number of entries received determines the odds of winning. Seven (7) winners will be selected. The prize packages will be sent directly from the giveaway sponsors. The #BrunchWeek Bloggers are not responsible for the fulfillment or delivery of the prize packages. Bloggers hosting this giveaway and their immediate family members in their household cannot enter or win the giveaway. No purchase necessary. Void where prohibited by law. This promotion is in no way sponsored, endorsed or administered by, or associated with Facebook, Instagram, Pinterest, Twitter or any other social channel mentioned in the #Brunchweek posts or entry. 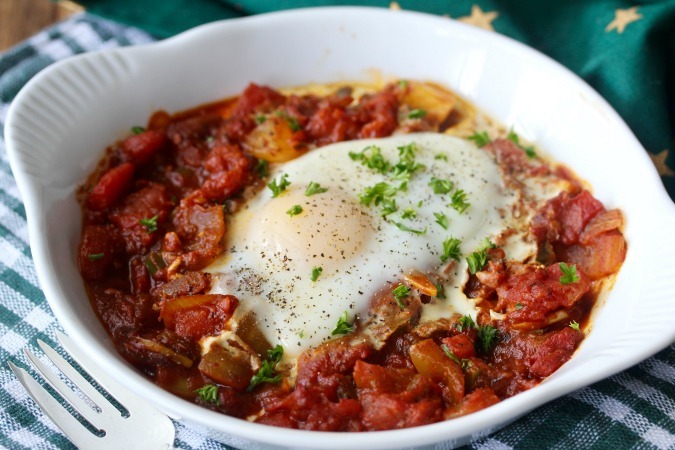 a favorite of mine... although I must confess I often make a very quick version of it, without too many bells and whistles - basically a quick tomato saute with an egg in the center... it's often my lunch! That sounds easy and delicious. 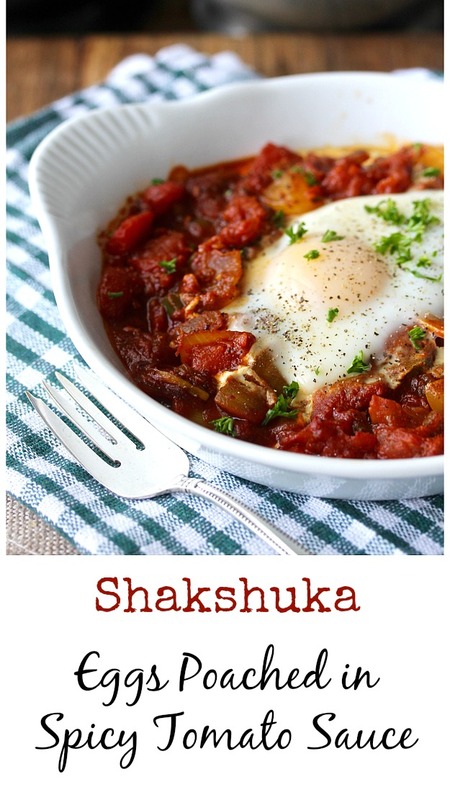 I discovered shakshuka last year and LOVED it. We have had numerous versions since then. Where have I been? This is sooooo good! This is a favorite quick and easy anytime meal! So much flavor and so simple. Love it! We tried it with cod and it was just as delicious!